Letter from F.P. 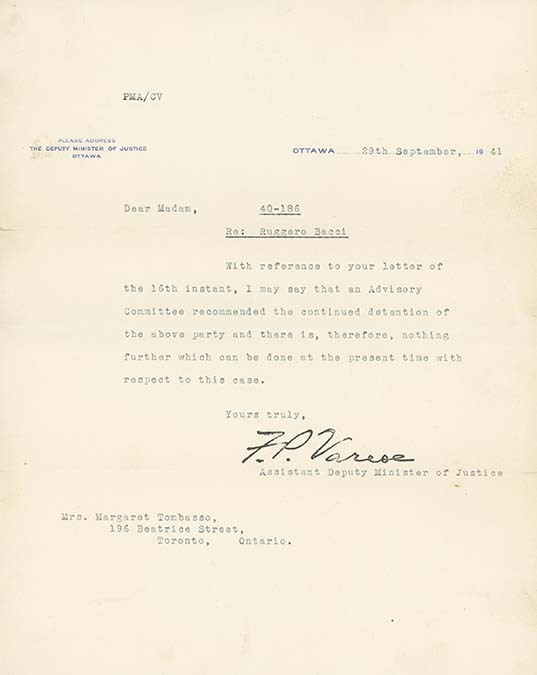 Varese, Assistant Deputy Minister of Justice, to Margaret Tombasso, September 29, 1941, regarding the internment of Ruggero Bacci. Varese notes that as a result of Bacci's case review by the Advistory Committee, a decision has been made to continue his detention. Margaret Tombasso is identified in another letter as Bacci's sister-in-law. It's unclear what her relationship was, if any, to Alessandro Tambosso, an internee also from Toronto. With reference to your letter of / the 15th instant, I may say that an Advisory / Committee recommended the continued detention of / the above party and there is, therefore, nothing / further which can be done at the present time with / respect to this case.